Spring has finally sprung. Almost. We are on the brink of sunshine and warmer temperatures, and that means that it’s time to clear off dust bunnies and give your apartment a good old fashioned spring cleaning. There are few things better than starting fresh with a sparkling apartment. One of the quickest ways to tidy up your apartment is organization. When you declutter your apartment you will give it a bright new appearance and make the rest of your spring cleaning list, a little simpler. The best way to begin the process of organization is to get rid of things. Recycle, give away, and trash things that you don’t need or really want. You can easily get bogged down by sentimental attachment when you try and eliminate clutter, so creating piles is your best bet. Group together things you are unsure about giving up, things with which you are ready to part, and things you definitely want to keep. Evaluate the things you are unsure about a week later and see if anything has changed. You should be able to move some of these things to different piles once you have had time to become less attached. Apartments don’t often have quite as much storage as houses, and it can be tough to get all of your belongings to fit in your space neatly. The trick to making your apartment appear less cluttered is to create storage with a few clever changes. If you’re going to get bookshelves, be sure to get the tallest ones you can fit. This utilizes wall space that otherwise goes untouched. 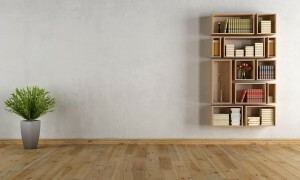 Shelves can be added to any wall if you don’t have room for full book shelves. Purchase a higher bed frame and use the space underneath for storage or get a headboard with built in shelving. Shelves are truly your best friend when you live in an apartment. Be careful not to clutter shelving with unnecessary objects though. It is great to have some empty space for growth. Bulky furniture in a tiny space can make any room look much more cluttered than it actually is. Think more strategically when you make new purchases. Glass tables create the illusion of open space while still giving you all the function you need. Similarly, you should opt for couches and chairs with small legs and sleeker designs in order to minimize the space they take up. Avoid adding an entertainment center by mounting your television on the wall. This can be a great space saver. This entry was posted on Monday, March 2nd, 2015	at 8:11 pm	. Both comments and pings are currently closed.